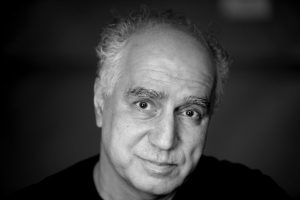 Nubar Alexanian is a highly acclaimed photojournalist and filmmaker who, for the past 40 years, has worked for magazines in the U.S & Europe including Life Magazine, The New York Times Magazine, Fortune, Geo, Time & Newsweek, National Geographic and many others. He’s also produced and directed long and short form videos for organizations and companies such as Bose Corporation, The Conversation Project and Project SAVE Armenian Photograph Archive. Nubar has six books in print, including “JAZZ” with Wynton Marsalis and “Nonfiction Photographs: From the Film Sets of Errol Morris”. Since October 2011 he has been working on a feature documentary film, with his daughter Abby, that deals with the powerful legacy of the Armenian genocide and the ways that a century of silence and denial has shaped their family. His production company, Walker Creek Media, LLC was created in 2006 and produces short documentary films for non-profit organizations. We spoke with Nubar as he was preparing to show his short film, “Recipe for Disaster,” at the Salem Filmfest. FC: How did this issue come to your attention and what made you decide to make a film about it? Nubar: I’ve lived in the marshes of Cape Ann for a long time as a photographer and avid striped bass fisherman. So I know these marshes very well. However, in June of 2017 I heard about the explosion of the green crab population and was stunned that I had not heard about it before. How could this be? How bad was it? Like many filmmakers, producing a film is a way of educating myself and finishing the film is a way of sharing what I’ve learned. FC: How you piece together your story/narrative? Nubar: In addition to filmmaking I have an extensive background as a photojournalist. So I approach documentary films as a journalist. This means lots of research, discovering who the right people are to talk to and shooting a lot of footage. Shooting a lot is important for me because I love the process of finding the film as we shoot…as I’m getting to know the subject. Over the 15 months it took to complete production, the narrative arc changed substantially, from a story about food to an environmental horror film, of sorts. FC: What were the most challenging aspects of making the film? Nubar: The science in this story was quite a challenge. This was, in part, because the population of crabs has been increasing so fast, that the science was slow to catch up and scientists often disagreed about what was actually happening. Are the crabs destroying the structure of the marsh, or not? If not, who is making all those tunnels in the Great Marsh that are causing the banks to cave in? Six months ago we did a screening of an earlier version of the film in Gloucester to a packed audience. And during the Q&A I thought a huge fight was going to break out in the audience about what is actually happening with the crabs and why. It was very interesting. FC: What do you hope audiences will take away from seeing the film? Recipe For Disaster is a wake-up call—to people and policy makers alike—about the fact that there are billions of crabs in the Great Marsh. No one knows about this problem! When Senator Bruce Tarr (MA) saw the trailer for our film he said, “OMG, there’s a horror film taking place in my district and I had no idea it was going on!” If people don’t know about the problem, the folks trying to solve it have little access to the resources they need. Everyone agrees on one thing: the crabs aren’t going away. The only solution is to find ways to keep pressure on them to slow the growth of their population. We’ve launched a comprehensive social media campaign to drive traffic to the film since it went live online on April 5th. FC: How did you discover Filmmakers Collaborative? Nubar: My daughter and I joined Filmmakers Collaborative in 2012 when we started working on a feature length documentary film about the Armenian Genocide and its effect on our family. (We are currently in post-production and hope to finish this year.) Back then, we needed a fiscal agent, which is one of their important functions and helps us raise the funds we need. Filmmakers Collaborative is also very well connected and committed to the filmmaking community and have been endlessly helpful to all of us.